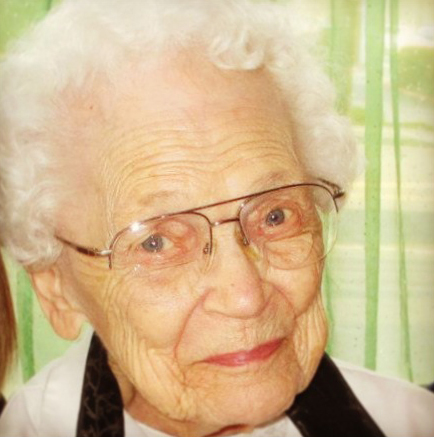 My mother recently had her 100th birthday! While that is a remarkable achievement, it is not something I would normally post here. Except for this. Over the past number of months, during a period of her shaky health, I have been making daily visits to her assisted living home, and our conversations provide two important perspectives on technology and change. The first is simply the vast technology change that has occurred within her lifetime. (And it makes we wonder about the next 100 years.) The second is her approach to dealing with new technology. That makes me wonder about effective ways of managing this change. Even helpful and useful technology is often slow to be accepted. When Mom was growing up, she did not have electricity or plumbing in the family home. She told me about lighting the lanterns in her house (two bedrooms for a family with six girls). The early Christmas trees in her home had real candles. The family went to an outhouse in the back. They took baths once per week in a tub placed on the kitchen floor — all six girls (she was fourth) using the same bath water in order of age. Then her mom would wash the kitchen floor with the remaining water. They would visit friends and family using a horse and buggy. Their refrigerator was an ice box, and a horse-drawn cart would come through the neighborhood delivering blocks of ice. They lived in Des Moines, Iowa (the capitol city), but they had chickens in their yard. When they had a chicken dinner, it meant their father killed a chicken in the back yard. She told me the story about her grandmother, a recent immigrant from Sweden, getting separated from her father after coming to the United States. Her grandmother had been taken in by a family and worked for her keep, a modern-day house slave. And when her father finally tracked her down in another city several years later, they agreed to meet in a certain town, each coming by train from the opposite direction. But when the trains arrived about the same time, the father saw his daughter in the train on the other track— just as it was pulling out of the station. It was several more months before they were able to finally connect. No cell phones or amber alerts! Things started to change at the time they moved houses when she was 9. This meant running water and electricity, though electricity was still considered dangerous with a fear of fire. When she was 12, her father bought his first car. There were no license requirements, either for the car or for driving it, and her father paid cash. When her father told the person who sold the car to him that he didn’t know how to drive, he was told, “You’ll figure it out,” and he was given the keys. The garage next to the house was the place where the storm windows were stacked, and he drove into the garage and promptly ran into the windows. Their first telephone came about this time as well, with five others on a party line. The calls to their house were identified by two short rings, but the code certainly didn’t stop the neighbors from listening in. This was the neighborhood news service. Even after they got a single line, she worried about talking too long on a “long distance” call. Though there are certainly places in the world where many of these features still continue, most of us in the West would see this as a very different world from the one in which we live. Computers, automobiles, airplanes, televisions, and cell phones, not to mention GPS and social networks, are often regarded as basic in our lives. How would we function without them? Mom and I also talked about how she adapted to the technology, and it was slow indeed. She never learned to drive and never owned a television set. 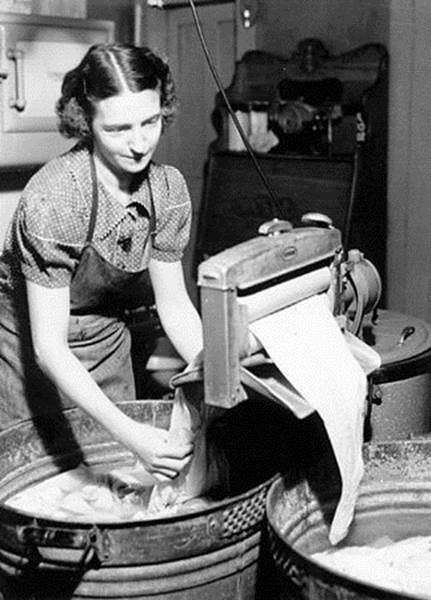 Wringer washing machines remained popular until 1953, when sales of automatic washers exceeded them, according to one web report. Mom wanted to keep her wringer washer, and when the old one failed, Dad paid a premium to replace it with a new wringer washer, because they were no longer a standard product. We tried to set her up with a computer to exchange messages with her younger sister, but neither of them wanted anything to do with this. We did a Skype call with my brother in Sweden one time when she was at our home. She was amazed. When we concluded the call, she stared at the computer and asked, “Where did he go?” But she hasn’t wanted to do this again. Her memory continues to surprise me. She likes to sing, and will occasionally forget the second line of the second verse of a song from her childhood. When this happens, I frequently pull out my iPhone and enter a few words of the song into Google. Usually I can pull up a version of the song and play it for her, filling in the missing line. She has asked me how I happen to have all of these songs in this little device, but I haven’t found the right explanation for her. While Mom is likely more technology resistant than most, there is a spectrum of people in our workplaces that starts with those who embrace every new gadget, and also includes those who would reject every new technology. Every business needs to find a way to manage the people side of technology. The interesting thing is that both ends of the spectrum can cause problems for a business. Some of the technology adoptions turn out to be a waste of time and money, while at the other end, there is a loss of productivity as the organization waits for those who would resist, often subtly and with good arguments. Fortunately, Miriam, a part-time worker by choice, was very proficient in using the PCs from the moment they arrived. More importantly, she was soft spoken, kind, patient, and had very little to prove. So I made a promise to Connie. Your assignment over the next month is to take four hours each Thursday morning to explore the PC with Miriam’s assistance, I told her. At the end of that period, you may decide to keep your typewriter. After two hours that first morning, she came into my office and said in an uncharacteristically strong voice, “I have to have one of those PCs on my desk.” Overcoming the fear of trying something new is sometimes made easier by a confidence that you don’t have to look silly or learn all at once. But not all of the time. My dad decided to try something similar with Mom and help her to learn to drive. But after a valiant attempt at driver education, the project was abandoned. Most of us don’t live as long as Mom. But one thing (out of many) that I have learned from her is about technology — its frantic pace and its challenge to human adaptation. One author (Bob Seidensticker, Future Hype) argues that the 1800s, not the 1900s, was the century of most rapid change, so this is not a recent phenomenon. There is no reason to believe technology will slow down its pace of change. Businesses will continue to look for solutions to bring its workforce along the journey, and I predict (boldly!) this will continue to be a challenge. Thanks for another lesson, Mom. And Happy Birthday. Love this, Al! Both a wonderful tribute to your mom, and an insightful commentary on technology changes and how/whether we adopt them.